Devany from Still Playing School is with us today, as part of our ABCs and 123s letter and math series. 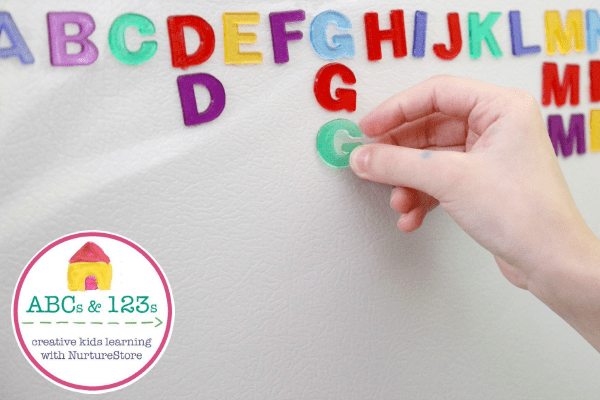 She has a super idea for a letter sorting activity that works on matching, fine motor skills and alphabetic order all in one fun game. We love rainbow fine motor activities! Our colorful literacy exploration includes fine motor work with letter recognition as well as categorizing and sorting for math. Kids can’t resist matching the letter jewels and counting how many of each they’ve found. You will need contact paper, letter jewels, and a vertical surface. This same invitation would be pretty in a sunny window! Alternative ideas would include letter magnets or stickers used in the same way! We taped the contact paper sticky side out on a vertical space (in this case we used our refrigerator). I sorted one row of letters in alphabetical order as the children watched and helped me recite the alphabet. We put the remaining letters in a bowl for the children to select and match under the corresponding letter that was already on the board. Children are working on a vertical space so they are strengthening their arm and shoulder muscles for future writing activities. They were also practicing fine motor skills as they placed and removed the letters on the sticky paper. 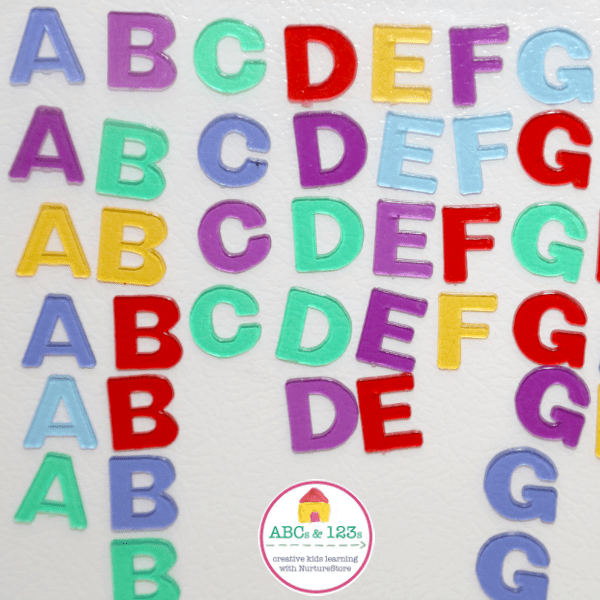 We once practiced a similar rainbow letter formation activity that was also a huge success! Our preschooler named letters and matched them to the ones already on the board as our older daughter practiced alphabetical order skills as she looked for the letters at the beginning, middle, or end of the row. The children also counted and compared how many of each letter they had found as they worked discussing mathematical concepts of more, less, and equal amounts. 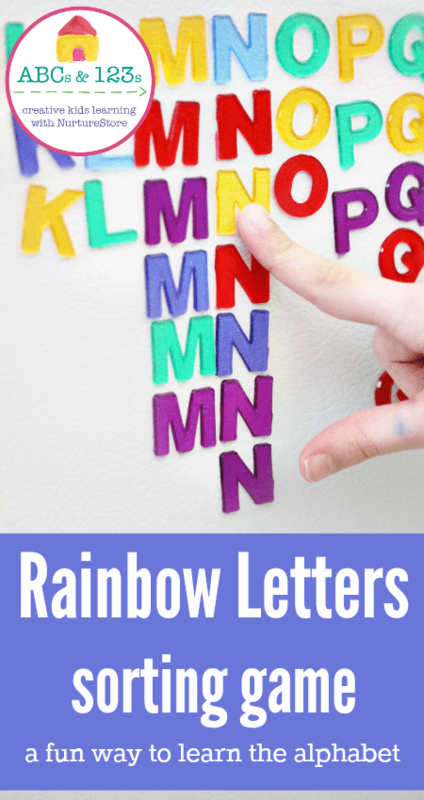 This engaging rainbow letter sorting is an activity that children can return to as their attention and interest draws them in to continue their work. We left it up over the course of a week as an ongoing collaborative project. Devany LeDrew is a former kindergarten teacher who writes at Still Playing School where she shares play based learning activities. She specializes in fine motor activities and has co-authored the book 99 Fine Motor Ideas & 100 Fine Motor Ideas!